All-U-Want - Create and edit items, entities, spawners, and more! News: Updated to 1.7.10 FINALLY! - Create and edit any item. Create items with unlimited enchantments up to level 32767, custom attributes, custom names, pretty much anything that can possibly be on an item. The items even work in creative multiplayer! - Create and edit every aspect of any entity. 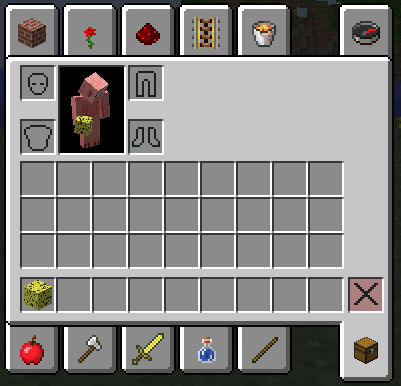 Have you ever wanted an falling anvil riding an invincible creeper with a block of diamond on its head riding a spider with fire resistance riding an invisible saddled pig? Well now you can have one. - Create and edit every aspect of any tile entity. You can now put that creature that you made into a mob spawner and have it spawn 10 of them every second. Then you can mark it with a sign with colored text. Then make everyone die with a beacon of wither and poison. IMPORTANT: This mod requires forge. 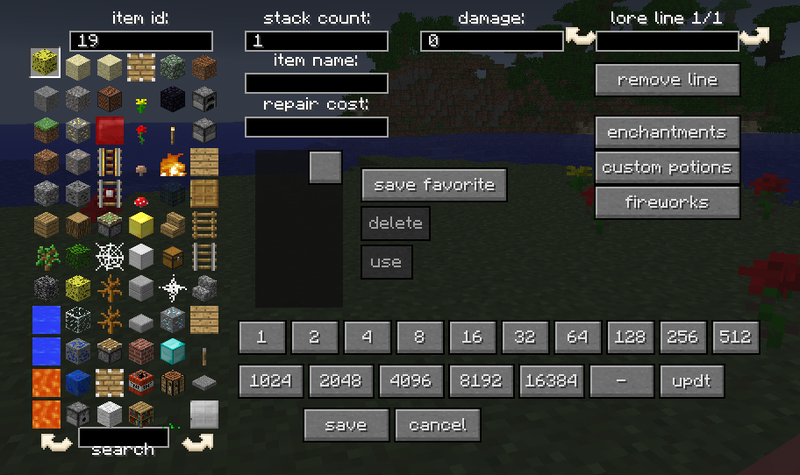 - Added "Command" button in inventory and entity editor GUI that copies the command to spawn it into your clipboard for pasting into command blocks. - Pressing enter while typing in search gets the top item, and pressing up and down selects items below it. - More stuff that I forgot about. I should write it down somewhere when I add a new feature. - Tons of bugs fixed. - Fixed crash in potion GUI. - GUI now clicks when opened. - Got rid of dirt background in some GUIs. 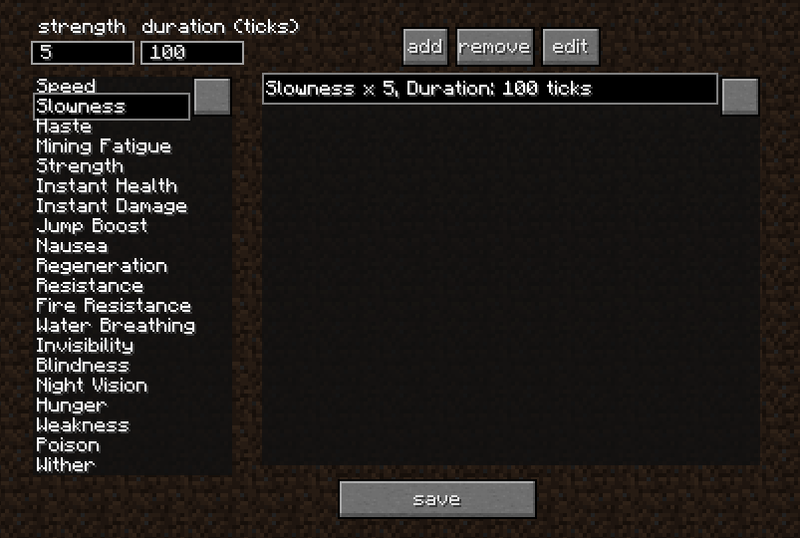 - Added "Ambient" option in potion effect GUI. This doesn't actually do anything yet, but in the entity editor on entities, it makes the effect invisible. - Fixed armor color text field disappearing if you type a wrong letter. - Fixed count going above 127. - Hopefully fixed crash with toomanyitems. - All-U-Want no longer opens its GUI when you press 'r' while typing something into the creative search. - Fixed crash with better sprinting (hopefully). - Fixed crash with editing potion effects. - Fixed crash when trying to edit or remove attributes when there weren't any. - Hopefully fixed crash with NEI. - Fixed control option showing up wrong. - Added all 3 new potions effects! - Fixed search feature not finding items with more than one line. 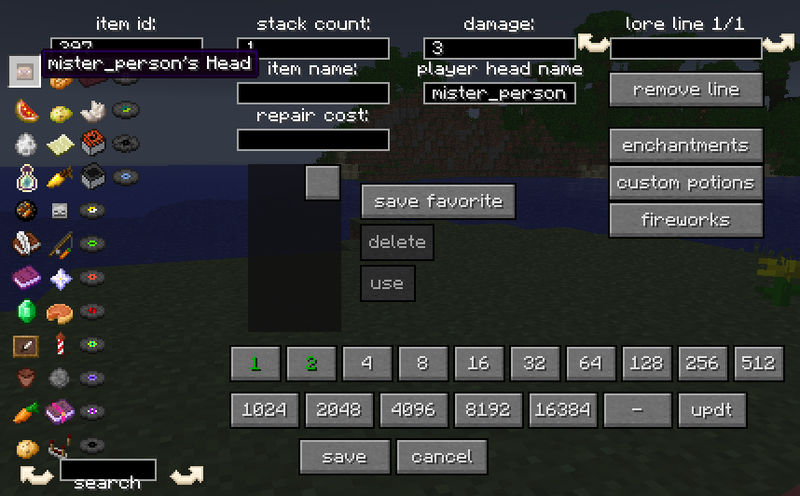 - Improved **:** format in potion GUI. 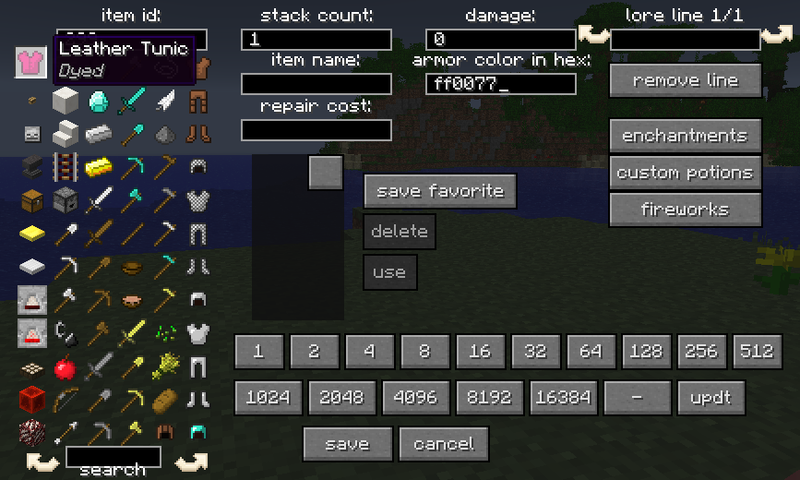 - Fixed bug with editing potions. - You can now have unlimited pages of favorites! Click the right arrow button to get a new page. - You can now drag and drop things in "scroll boxes" to rearrange them, like favorite items, enchantments, and potion effects. - Fixed crash with short enchantment names. - Fixed mod on survival single player. - Completely reorganized GUIs to fit in smaller windows. - Added all log and tall grass types. - Fixed bug where § would only show up at the end of text boxes if you used the button. 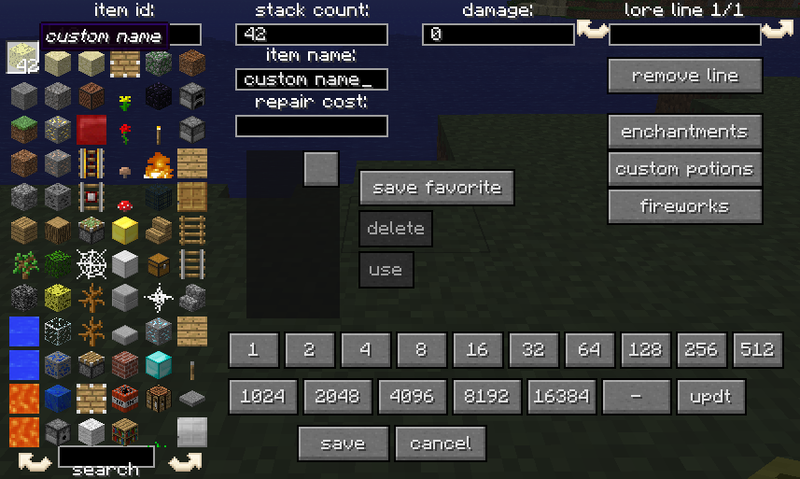 - Number buttons now work if there's no text in "damage". 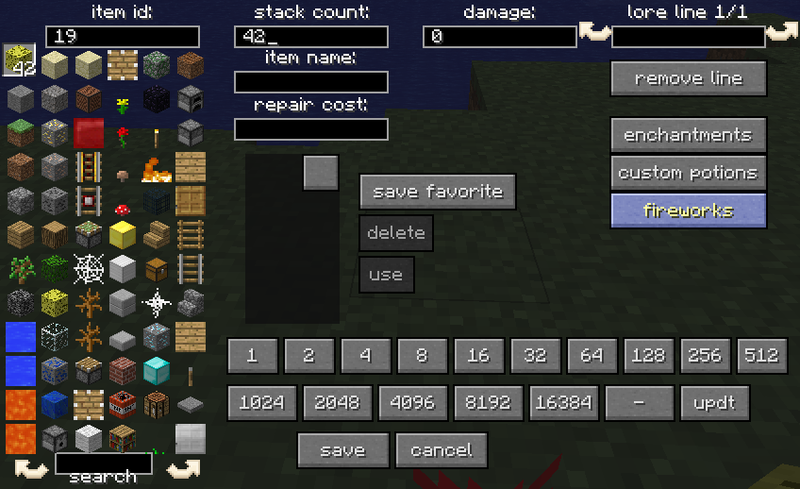 - Fixed bug where left and right buttons would put a random item in the slot. - Enchantments from mods should now show up. - Items with high item ids should now work. 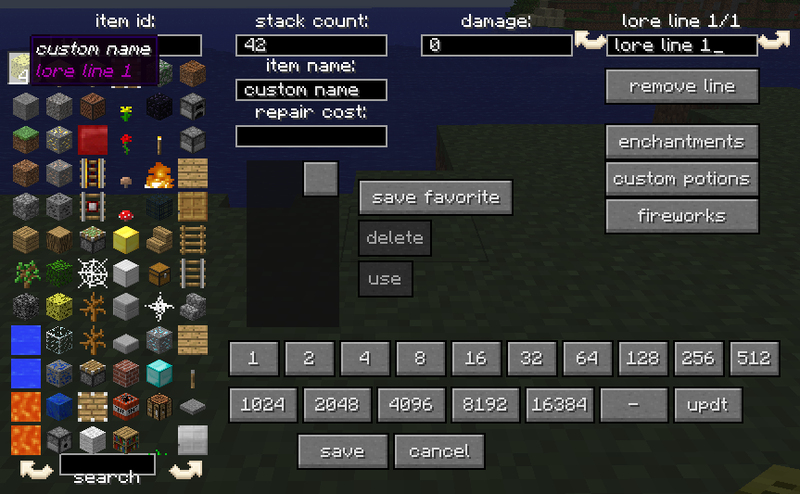 - ##:## format now works with potion lengths in potion gui as well as tick numbers. - To make it display ticks instead of ##:## press the new "time" button. - If you type into the main gui and there are no other text boxes selected, you will start typing in search. - Many other small improvements. - Added all the blocks and items with different damage values to the list so you don't have to find the correct damage value. - The § won't dissapear in text boxes if you type something after it. - Fixed duplicate search results. 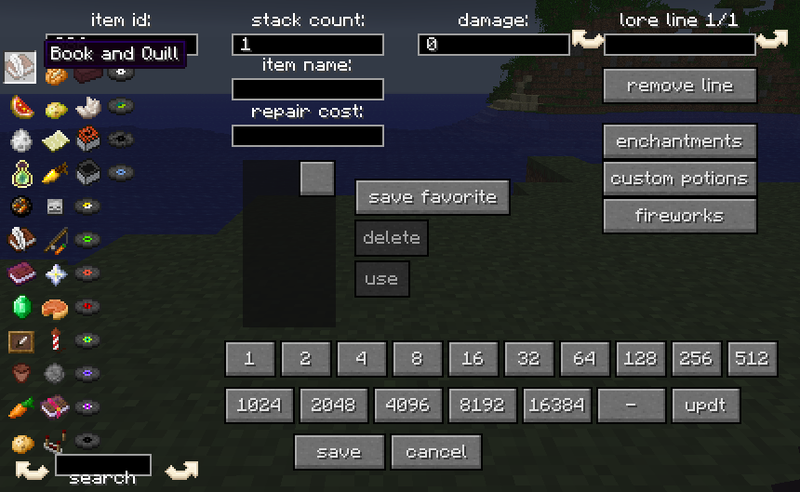 - Shift-clicking on the slot on the top left will change between 64-stack and 1-stack. - In the "favorites" box you can now see 27 items at a time. 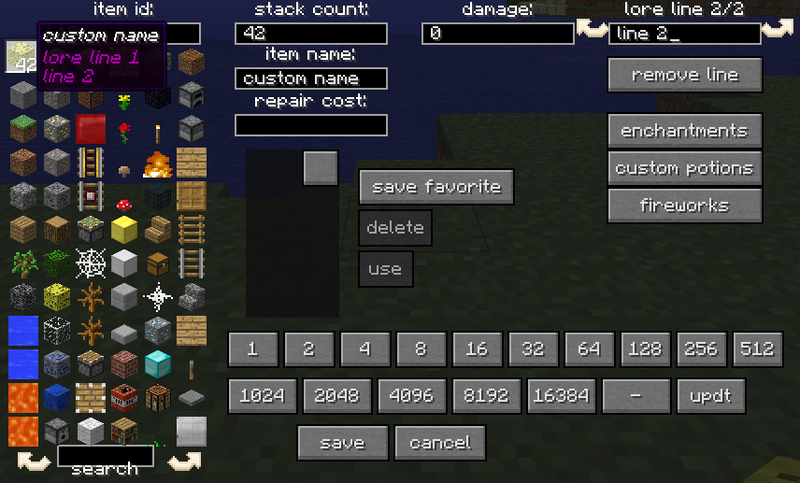 - Rearranged GUI a little. - You can now see 21 items in the "favorites" box at a time instead of 3. - Changing damage value makes all items in the list render with that value. - Holding shift causes all items in the list to be a full stack. - Page arrows render better. - Custom potions and firework buttons are only visible if you give yourself a potion (water bottle) or firework. - Compatible with minecraft 1.5.2. - Added the ability to edit firework stars. 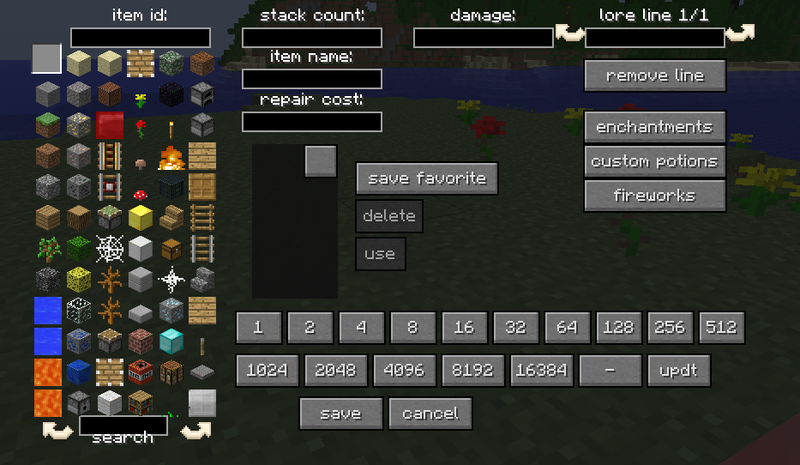 - Added the ability to edit enchantment books. - Fixed background getting dark when you mouse over an item. - Fixed control option saying the wrong thing. - Changed useless "updt" button to "§" button so you don't have to find the key combination. - Fixed conflict with toomanyitems. - Fixed crash with forge. - Added the ability to download the mod. To prevent people from using it, take away alluwant.creative from them (they have it by default). To use it in survival, give yourself alluwant.survival. If you have permission to give yourself items, you are automatically able to give yourself normally forbidden items. NOTE: ProtocolLib also needs to be installed for the plugin to work. Also included in the plugin is compatibility with the mods I'm still working on and haven't released yet, so when they come out you will be able to use them on your server. The permissions for them are alluwant.entity.survival, alluwant.entity.creative, alluwant.block.survival, and alluwant.block.creative, all of which are disabled by default. 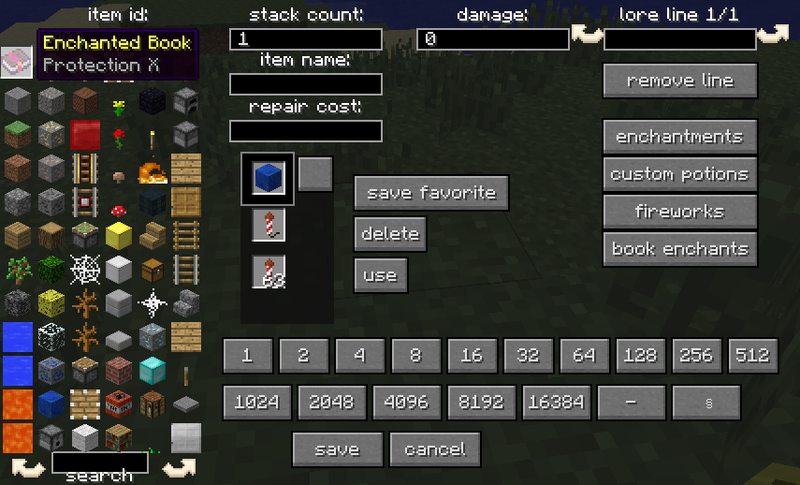 First, put your mouse on the inventory slot you want items in, then push 'r' to open this GUI. You can use this to give yourself new items or change values on existing items. The slot you just selected is now at the top left of the screen. Click on the item you want on the left to select it, and it will appear in the slot on the top left. To see the rest of the items click on the arrows in the bottom left. You can also search for items by typing their name in the "search" box. I clicked on the sponge block. Now you can modify the sponge. Find out how to modify items in the other spoilers. Once you're done modifying the sponge, click "save". The sponge is now in your inventory! If you don't like the changes you made to that slot, press "cancel" or the escape key and your inventory won't change. If you want to give yourself more (or less) sponges, type the number of sponges you want in the "stack count" box. The slot on the top left now has the amount of sponges you chose. You can enter numbers less than 1 and more than 64, but the items might act weird.Certain attributes of items are controlled by their damage value, like wool color, tool and armor durability, and wood type. There are two ways to change the damage value of the item you want to give yourself. You can enter a number in the "damage" box or you can click on the buttons with numbers on them at the bottom of the screen. This is useful for potions. Here I select wool, than I enter the number 14 for red. If you want your item to have a custom name, just type they custom name into the "item name" box. If you want your item to have text on multiple lines, you can use lore text. For the first line of lore text, type the text you want in the "lore line" box. If you want more lines click on the right arrow next to the "lore line" box and type more text. To go back to previous lines click the left arrow. To remove a line click "remove line". The repair cost controls how much it costs to rename or repair something in an anvil. It gets bigger every time you repair something. To change the repair cost, type it into the "repair cost" box. The repair cost won't be visible on an item until you use it in an anvil. If you put a piece of leather armor in the slot at the top left, a new text box will pop up called "armor color in hex". To change the color of the armor put a hex color value in that box. Use google to find the color you want if you don't know how hex colors work. To give yourself player heads with player names, first give yourself a head. If you use the mod, they're on the last page and named "head". Once it's in the slot at the top left, a new text box will appear called "player head name". Type the exact name of the player you want to have the head of. The damage will change to 3 because it needs to for the player name to work. If you have a written book and you want to change the author or name of the book, two text boxes will appear named "author" and "title". Change these to change the author and name of the book. To edit the contents of the book, either change the id in the "item id" box to 386 or pick "Book and Quill" from the item selection (second to last page). Then click "save" and you can edit the book again. When you want to sign it again re-enter the author and title. To add enchantments to an item, select the item by putting it in the slot at the top left, then push the "enchantments" button. 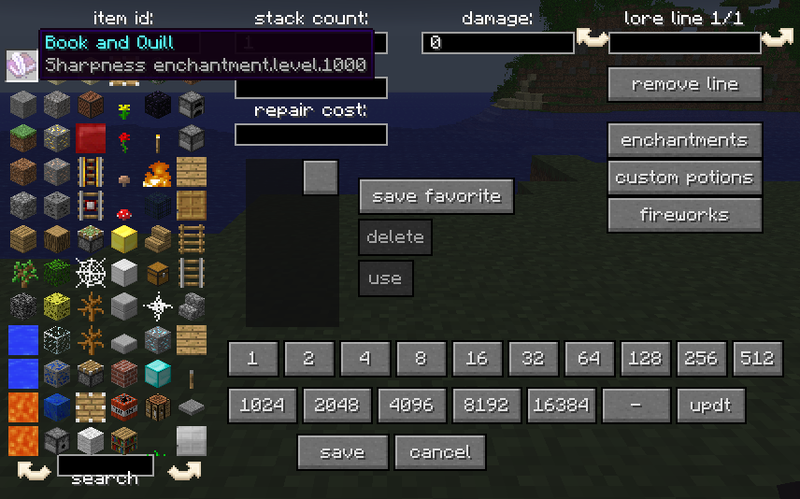 Select an enchantment from the list at the left, choose the enchantment's level with the "enchant level" text box at the right, and click "add enchant". The enchantment will be added to the list. You can add as many enchantments to the list as you want, because the list scrolls. To remove an enchantment, click on it, then click "remove enchant". When you've added all the enchantments you want click "done". Enchantment levels can be between -32768 and 32767. To get a potion with potion effects, just find the one you want on pages 6-8. If you want even better effects though, click on a potion then click the "custom potions" button. To add a potion effect, first select the effect you want on the left, then enter the potions level in the "strength" box and the potions duration in the "duration" box. The time is in ticks, where 20 ticks = 1 second (1000 ticks = 50 seconds). Then, click "add" to add the potion effect to the list. You can have unlimited potion effects, since the list scrolls. If you want to remove a potion effect, click on it then click "remove". 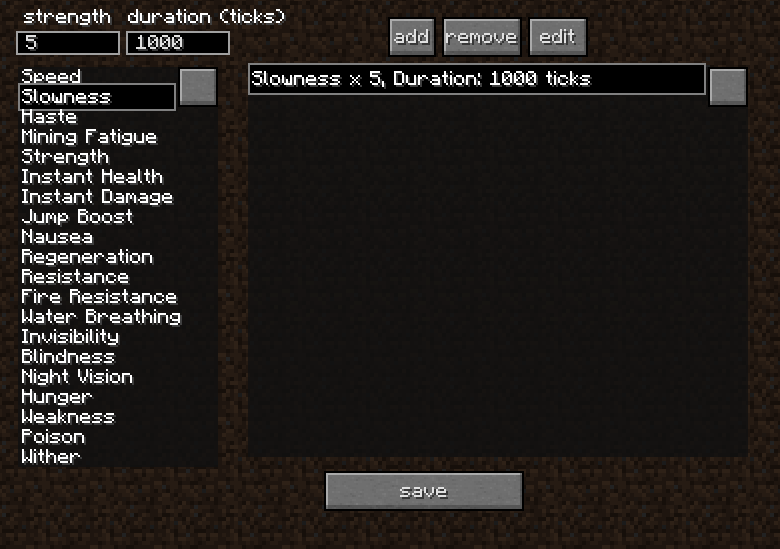 If you want to modify something about a potion effect like it's duration or level, click on it then click "edit". The "edit" button now says "done", and now the text boxes have the values of that effect and the effect that it uses is selected on the left. You can change the numbers in the text boxes and which effect on the left is selected then click "done" (NOT "save") and the potion effect in the list will be changed. Here I change the 100 ticks to 1000 ticks. Potion levels can go from -128 to 127 (what do negative ones do?) and durations can go up to 2,147,483,648. Tutorial coming soon, until then click on the "Firework Rocket" (last page, id 401), click "fireworks", and see what all the buttons do. TERMS AND CONDITIONS 0. 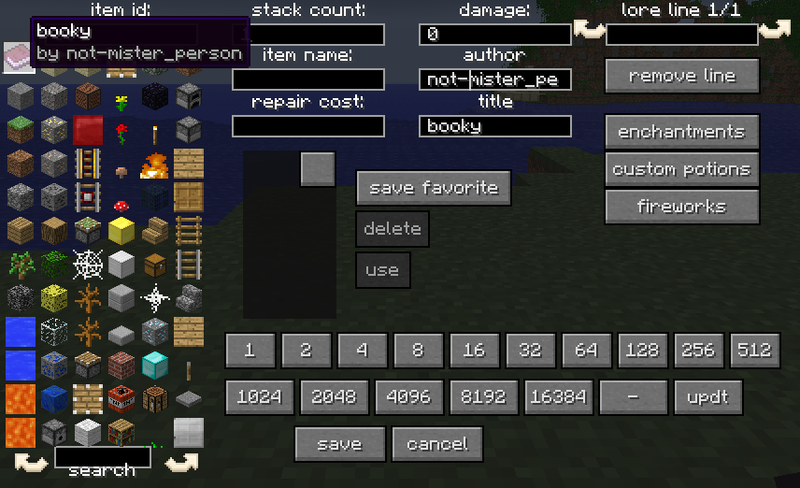 USED TERMS MOD - modification, plugin, a piece of software that interfaces with the Minecraft client to extend, add, change or remove original capabilities. MOJANG - Mojang AB OWNER - mister_person, Original author of the MOD. Under the copyright terms accepted when purchasing Minecraft ( USER - End user of the mod, person installing the mod. 1. LIABILITY THIS MOD IS PROVIDED 'AS IS' WITH NO WARRANTIES, IMPLIED OR OTHERWISE. THE OWNER OF THIS MOD TAKES NO RESPONSIBILITY FOR ANY DAMAGES INCURRED FROM THE USE OF THIS MOD. THIS MOD ALTERS FUNDAMENTAL PARTS OF THE MINECRAFT GAME, PARTS OF MINECRAFT MAY NOT WORK WITH THIS MOD INSTALLED. ALL DAMAGES CAUSED FROM THE USE OR MISUSE OF THIS MOD FALL ON THE USER. 2. USE Use of this MOD to be installed, manually or automatically, is given to the USER without restriction. 3. REDISTRIBUTION This MOD may only be distributed where uploaded, mirrored, or otherwise linked to by the OWNER solely. All mirrors of this mod must have advance written permission from the OWNER. ANY attempts to make money off of this MOD (selling, selling modified versions, adfly, sharecash, etc.) are STRICTLY FORBIDDEN, and the OWNER may claim damages or take other action to rectify the situation. 4. DERIVATIVE WORKS/MODIFICATION This mod is provided freely and may be decompiled and modified for private use, either with a decompiler or a bytecode editor. Public distribution of modified versions of this MOD require advance written permission of the OWNER and may be subject to certain terms. Thank you for downloading! If you have any problems, questions, suggestions, feedback in general, if you find any bugs, or if you just want to support the mod, please post a reply to this thread and I'll make sure someone responds. All-U-Want! Create and edit awesome custom items, entities, and tile entities! The ultimate map-making tool! This looks awesome. I'll report any bugs if I find any. NOTICE: THE 2.1 VERSION OF THE MOD DOES NOT WORK WITH MULTIPLAYER!! YOU ARE ALLOWED TO UPDATE AND RELEASE THIS MOD DUE TO IT BEING ABANDONED! THE OWNER CANNOT BE CONTACTED! IF SOMEONE DOES DECIDE TO UPDATE IT, SEND ME A COPY! So its a crappy version of too many items? EDIT: Wait, you can add Lores and damage values? I'll give this mod a bit of time to mature but it shows great promise as being an upgrade from a normal too many items. This is a powerful tool for map-making. Looking forward to this! Forge is not auto-compatible with Modloader mods. This doesn't work on Forge. Why did you make your mod with Modloader though? I can find very few large mods that use it, Forge is just more convenient. I think this mod is useless, NEI is better. It works in any multiplayer server where you have creative! even if you don't have access to ANY commands, and the server doesn't need to install anything! NEI probably has some features that this mod doesn't, but useless? Compared to NEI? No. 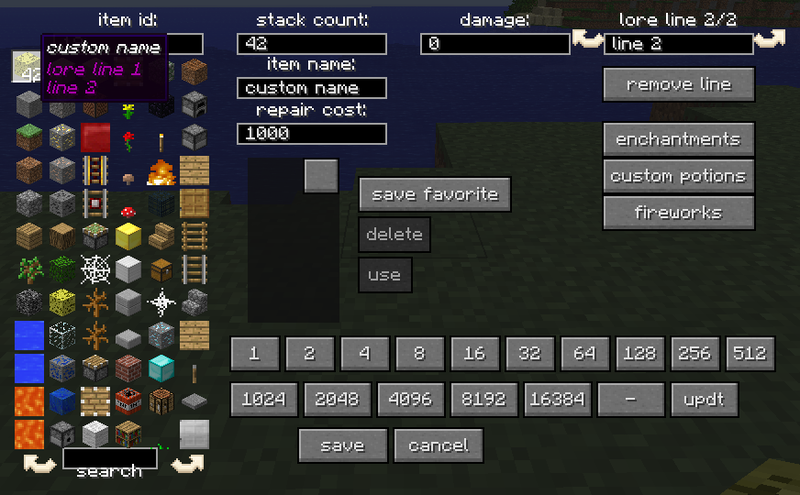 Gui is so confusing and there insn't gui resizing when minecraft is in a full screen but there is a lot of cool feature! Sorry the GUI is confusing, any ideas on how to make it better? Does it help if you read the tutorial? Can you be more specific about "gui resizing"? It works fine for me in fullscreen mode. Maybe a picture? Sorry about the download link, It's fixed now. 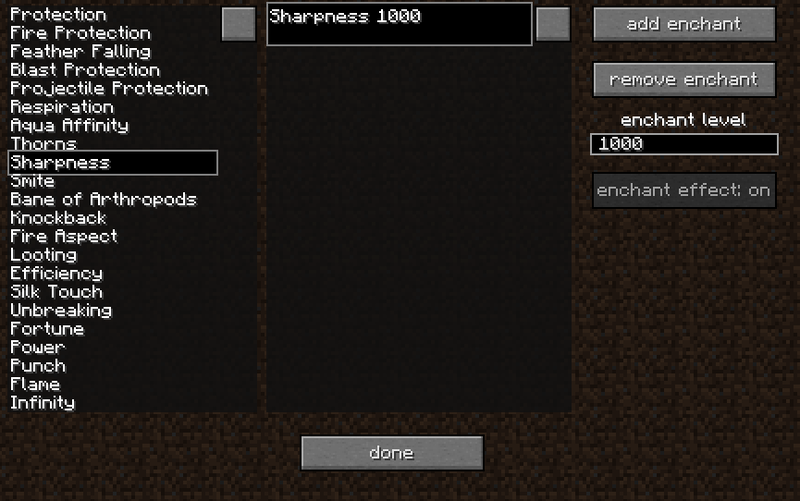 I always extract the mods I download and put the directly in minecraft.jar, so I didn't think of the zip. EDIT: can you confirm it works now? I hadn't tested it with forge, but I thought fml was also compatible with modloader mods. I removed that from the OP until I can get it working with forge. -Nvm, Copy+Paste seems to work. Seems like a useful mod. I will try this. Sorry about that. Normally you'd be right, § is impossible to make in normal minecraft. Normal minecraft text boxes block it. However, all the text boxes in my mod allow it. On windows you have to hold alt, then press "0167" on the numeric keypad, then release alt. The signature is very limited, check out my profile! and does it have custom spawners? like tmi and nei? Is there a button you hit to make the GUI appear? OpenGL: ATI Radeon X300/X550/X1050 Series GL version 2.1.8545 Release, ATI Technologies Inc.